When you don't cook (I see you out there, looking at me and giggling), sandwiches are a beautiful thing. Sandwiches can be as simple or as complicated as you desire. They are great for any meal. If I'm looking for something a little bit more substantial, I like a nice turkey on rye bread, with provolone, avocados, bacon, a little lettuce, and ranch dressing. Some people are fabulous chefs, and they still enjoy a good sandwich. 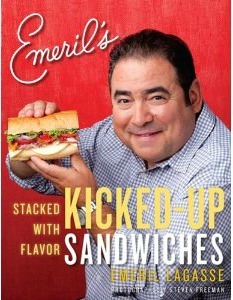 Emeril Lagasse is one of those sandwich-loving people, and he has a new cookbook, Kicked-Up Sandwiches: Stacked With Flavor, with more than 100 yummy sandwich recipes. He has some fancy sandwiches in there, but I was pleased to see peanut butter make at least one appearance, and there are also a few dessert sandwiches (that is something I would brave a knife to make). Am I making you hungry with all the mentions of sandwiches? If you are in the Orlando area, and would like to spend some time hanging out with Emeril Lagasse, you can see him prepare some of his favorite sandwiches at Macy's Millenia Mall on Thursday, October 25 at 4pm (3rd floor, Home Department). He will also be signing cookbooks purchased at the event. Space is limited, so please RSVP with Macy's to reserve your spot. Legal Stuff: I am a member of the Everywhere Society, and I was provided with compensation for this post. All opinions are my own, and I was not required to say nice things about Macy's, Emeril, or sandwiches. Peanut butter and Nutella. This is actually a complicated sandwich, as it involves the use of two knives. But it is worth it to have the Nutella goodness. Yum! But, I would leave off the tomatoes. I LOVE sandwiches! I also love peanut butter anything! This sounds like a cool event, thanks for sharing! Peanut butter is always a good choice! Oh snap forgot to say, my favorite sandwich to make at home is definitely a BLT. But, I am a club sandwich kind of girl when we go out. I love a good restaurant club sandwich. With a nice, crispy pickle on the side.